After this morning’s bus fire on the Beltway, Metro announced this afternoon that they are pulling the other 99 Orion VI Diesel buses from service while they replace the hydraulic pumps. The pump issue may have contributed to the fire that happened this morning. This is not the first time that the Orion VI bus series has had an issue with flammability. In 2007, Metro had an issue with braking systems and air dryers that caused a full refit of the Orion VI buses. 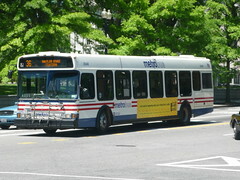 Metro began purchasing the Orion VI buses in 2000 and have approximately 100 in their fleet. There will be some delays today as the buses are cycled out and replaced with reserve buses. Yeah, there was a fire in Springfield along the beltway this morning involving an Orion VI Diesel bus. Bit different from the Ride-on that was in flames yesterday, I think.